A trio of 3 kosher (and equally important - absolutely delicious!) 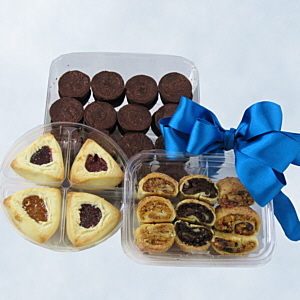 baked goods including 32 of our amazing Sugar Bowl Bakery petite brownie bites, Chewy's Assorted Gourmet Rugulach and Chewys Hamentashen Shortbread Cookies. Now thats good noshing!